It’s possible there were families in London getting this amount of housing benefit. There’s no way to be sure using official figures. Around the time of the 2010 election there were fewer than five households in London claiming the equivalent of £100,000 a year or more in housing benefit. The figures aren’t more precise than this because the numbers are all very small, and the government has to avoid the risk of identifying individuals. So all the numbers are rounded to the nearest 10 claimants. So ‘0’ claimants—which is what the figures show for early 2010—simply means ‘fewer than five’ as far as anyone is able to tell. It grew to 10 in late 2010 and stayed at that level to mid-2012—we don’t have any more recent figures than this. This is very small compared to the 800,000 housing benefit claimants in London at the time of the 2010 election, and the 4.8 million claimants nationally. The national average housing benefit award in May 2010 was £84.20, the equivalent of £4,390 a year. A freedom of information request by us a few years ago shows how this was distributed by the amount claimed. Mr Corbyn’s figures are roughly supported by a survey by the National Housing Federation (NHF) of its members, though the figure is 41% rather than "nearly half". It’s not clear how representative the respondents to that survey were of all providers affected. We’ve asked Number 10 which survey Mr Cameron was referring to when he spoke about leading questions. The NHF insists its survey was a financial viability survey rather than an opinion poll, and that the Prime Minister might have meant a separate poll carried out by Inside Housing magazine. People live in supported housing when they need a certain amount of personal care, support, or supervision—residents typically include the elderly, people with learning disabilities, and substance abusers for example. Residents in supported housing eligible for Housing Benefit can currently have some or all of their rent paid for. The NHF said last month that its survey of housing associations had shown that 82,000 specialist homes would become financially unviable and be forced to close due to plans to reduce housing benefit for tenants in the social housing sector. Those 82,000 homes represented about 41% of all respondents’ units. It said scaled up this means about 156,000 homes across the sector will cease to be viable and will have to be closed. One in four providers responding to that survey (24%) said this would be the case for all of their units, according to the figures sent to us by the NHF. Regular viewers of Prime Minister’s Questions will be familiar with this claim, made frequently by David Cameron. Regular readers of our PMQs analysis will be familiar with our response: it’s technically correct, but most social houses aren’t council houses. In the last Parliament around 6,700 homes were completed by councils in England, compared to 2,900 between elections in 1997 and 2010. 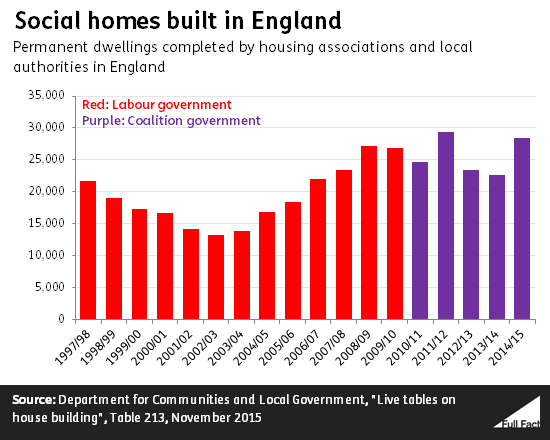 Including housing association homes, around 130,000 social homes were built during the five years of the last government, compared to 250,000 over 13 years with Labour. The claim that the last government built more homes, full stop, over five years than during 13 years under Labour is way off. Around 570,000 homes in total were built over the last five years, compared to 1,900,000 between 1997 and 2010. To be clear, the demonstrably incorrect claim attributed to the PM in this tweet isn’t what he himself said. 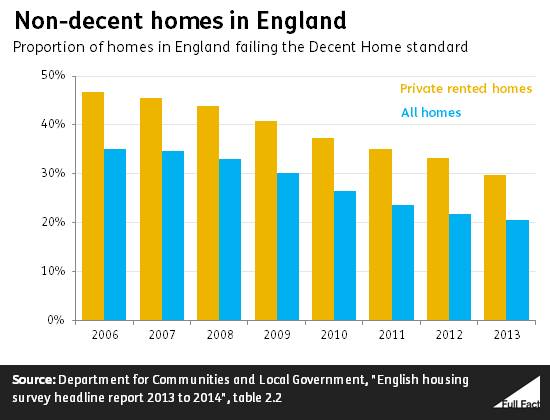 It’s correct that close to a third of privately rented homes in England don’t meet the official Decent Home standard. The exact proportion is 30%, according to the English Housing Survey for 2013 (the most recent one). The housing charity Shelter has given a figure of 33%, which was right based on the figures available at the time, but the situation has since improved (and has been improving since 2006, as far back as the figures go). Privately rented homes are still in worse condition than owner-occupied homes or social housing, though. The same report by Shelter is the source of the claim that six out of 10 renters have experienced problems like damp, mould or leaks in the previous year. These results come from a survey of private renters in England carried out by pollsters YouGov in 2014. It’s correct that tax income from the oil and gas industry is set to fall by 94%. The Office for Budget Responsibility forecast last November that UK oil and gas revenues will be just £130 million in 2015/16, a 94% fall from £2.2 billion in 2014/15. Oil prices are notoriously volatile and difficult to predict, which impacts on forecasts of revenue. Oil and gas revenues would be an important source of income if Scotland did have full fiscal autonomy. In 2013/14, Scotland generated about £50 billion excluding revenue from the North Sea. Including a geographical share of North Sea revenues makes that £54 billion. The Scottish government has acknowledged before that there would be volatility in the revenues. Before the referendum on whether Scotland should become independent, then Scottish First Minister Alex Salmond said that if Scotland became independent it would establish a reserve fund to protect the country from volatility in the market. Whether that was a feasible option was disputed at the time. That’s correct. There were 13,100 more full-time equivalent teachers in English state-funded schools in 2014 compared to 2010. That’s a rise from 441,800 teachers to 455,000. The number in secondary schools has fallen, though, from 219,000 full-time equivalent teachers in 2010 to 213,400 in 2014. Secondary school teacher training places are proving particularly difficult to fill, the National Audit Office said today.